Scarlet Dream, whose dam is the Count Dubois sired Equus Champion Asylum Seeker, made a big impression on Saturday when finishing second in the G1 Heineken 3 Oaks over 2000m at Randwick. Under jockey Blake Shinn, the 3yo Sebring filly powered home to take the runner up spot, beaten just 1.75 lengths by the winner Verry Elleegant. The latter has now won six of 11 starts, with Verry Elleegant’s previous victories including a score in the G1 Vinery Stud Stakes. Trained by Mark Newnham, Scarlet Dream has won or placed in six of her seven starts, with the Count Dubois granddaughter having also finished third in the recent G3 Carlton Draught Kembla Grange Classic over 1600 metres. A $95 000 buy from the 2017 Inglis Australian Easter Yearling Sale, Scarlet Dream is one of 3 winners produced by South African G1 winner and champion Asylum Seeker, whose Zoustar filly made $190 000 at this year’s Magic Millions Adelaide Yearling Sale. 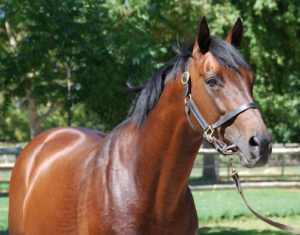 Asylum Seeker is one of three Equus Champions sired by the Klawervlei Stud based Count Dubois, whose previous stars include fellow Equus Champions Edict Of Nantes and French Navy, as well as the G1 winners Zaitoon and Zeeno. Count Dubois is also enjoying increasing success as a broodmare sire and is also damsire of the likes of G1 Thekwini Stakes runner up Melliflora, millionaire Budapest, top class sprinter Pinnacle Peak, KZN Fillies Guineas Trial winner Arianos Shadow, Java Handicap hero Ali Bon Dubai, and G3 Magnolia Handicap winner Schippers.